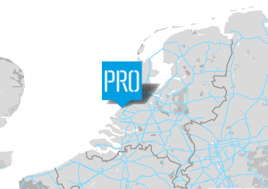 The Red Cross has asked Atelier PRO to investigate the possibilities of a new head office in the Netherlands. The invitation was triggered by a previous municipal report pinpointing the key issues, based on an urban development plan drawn up by Atelier PRO. The building is a landmark and gateway to the Laakhavengarage in The Hague. In the future it will determine the appearance of the renovated Leemansplein, which is a part of the campus of The Hague University. To signal its gateway function, the building leans forwards slightly towards the Leeghwaterplein. This also reduces the warming effect of the sun. The façades on the south, east and west have a panel structure that filters further solar radiation, while the north façade is entirely transparent to gain the maximal benefit from diffuse light. The offices are organised around a central atrium that drives the natural ventilation system. The climate concept is based on a hybrid system in which balanced ventilation only comes into operation when the outdoor climate is extreme. This results in an optimal, healthy and low-energy indoor climate. The central atrium also functions as a lounge, reception and meeting area.